First off, thanks for your overwhelming support of American Whitewater over the past 6 months. Since the Small World Adventures/American Whitewater/Smith Optics contest started back in April, American Whitewater has raised over $160,000 thanks to your generous contributions. That money will go towards the great cause of insuring that we will always have rivers to recreate on. 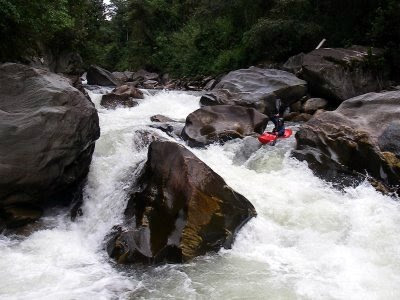 We drew out of the pool of people who donated to American Whitewater between April 1st and October 1st to pick the winner of a free week of kayaking in Ecuador with Small World Adventures. And the lucky winner is... Paul R. Hummel. Congratulations Paul! Your trip is good anytime during the 2008/2009 season. All you have to do is check out our schedule of trips and pick which one suits your paddling ability and your vacation schedule best (We offer Class II through Class V, November through March). 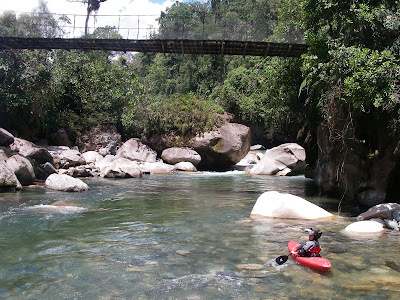 Then, contact our office to tell us when you are coming.We look forward to paddling with you in Ecuador! Didn't win? Don't worry, you can still paddle with us in Ecuador this season.Come join us on one of our weeklong, lodge-supported kayaking trips in the Amazon Basin. We stay in Small World's killer riverside lodge while eating gourmet food prepared by our chef Lily. We have an onsite massage therapist and world-class rivers literally in our back yard. 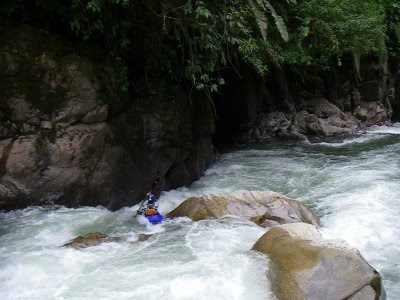 You can't go wrong with a paddling trip to Ecuador. We'll be there all winter, running Class II through Class V trips (we have raft trips too, so there is something for everyone). 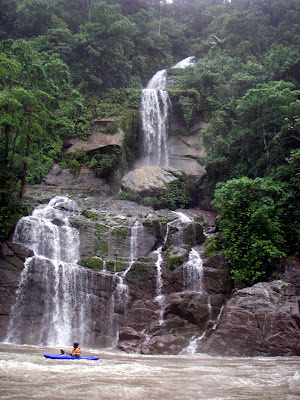 (PS, we will all be back down in Ecuador in about a week and we promise lots of NEW and great photos)! Darcy's version of rehab-winning the Gore Canyon race. It wasn't the best of boating summers for Darcy. After having knee surgery on her blown ACL (skiing is dangerous), she spent a dry summer building leg muscles and avoiding arduous put-ins and portages. By the time August 16th came around, she had some pent up energy to release at the Gore Canyon race. Off the couch and out of the office, Darcy won the women's division (again). While she's still taking it easy on her recovering knee, Darcy's back in the boat and making up for lost time. Don't worry, when you come paddle with her in Ecuador, I'm sure she'll wait up.